I love giving gift cards. So I use several of these card holders during the holidays. This year may be different since we have been advised in the news not to buy gift cards because of the economy and the fact that the store you purchased the gift card from may not be around in "2009" So this year I'll probably replace the gift card with cash. 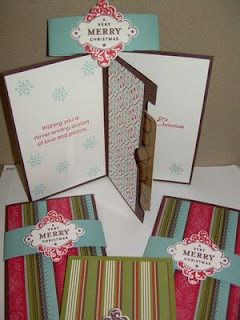 The beautiful paper on the featured gift card holder is from Stampin'Up DSP papers. This one from the holiday mini Ski Slope.